People experiencing domestic and family violence can now get the help they need more safely and easily using Ask Izzy, the mobile website developed by Infoxchange that connects people in need with housing, a meal, money help and more. With help from the NAB Foundation, Infoxchange has introduced a range of enhancements to Ask Izzy to provide better, safer family violence support. The changes to the website include a quick exit button, a new domestic and family violence search category, emergency numbers and best practice tips and warnings about safely using technology. These enhancements have been made as part of a two-year project funded by the NAB Foundation, which included a co-design process with service providers and people with a lived experience of family violence. Family violence survivor Vicky Vacondios says she would have found help much sooner if Ask Izzy had been available. 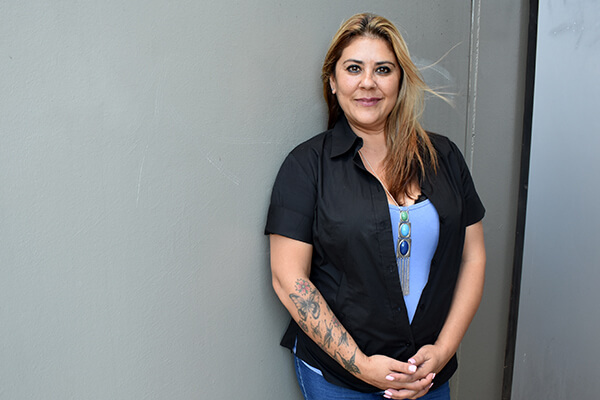 Family violence survivor Vicky Vacondios says Ask Izzy would have saved her from numerous setbacks on her journey to safety, including being turned away by a housing service at the last minute on a technicality. “I actually broke down into tears and felt so alone and lost for a moment. If Ask Izzy had been available, I wouldn’t have been in that situation and I would have saved myself the energy and time,” Vicky says. Infoxchange Social Innovation and Digital Inclusion Manager Jess Perrin says while family violence remains an incredibly complex issue, the latest enhancements to Ask Izzy are a perfect example of how technology can be used to support people in crisis. “We know from our research and co-design with people who have experienced family violence that trying to find help can be overwhelming,” Jess says. NAB General Manager, Customer Assist Campbell Morrison says the corporate sector has an important role to play alongside community partners to end domestic and family violence. “Through our NAB Assist hardship team we support our customers experiencing family and domestic violence in a number of ways,” Campbell says. Fifty-seven percent of Ask Izzy users are female, and 20 percent of people searching for housing on the site identify as escaping family violence. As part of the launch of the family violence enhancements, Infoxchange will be working with communities, organisations and people experiencing violence over the coming months to increase their understanding about e-safety and how to use Ask Izzy to find support.